It’s that time again! 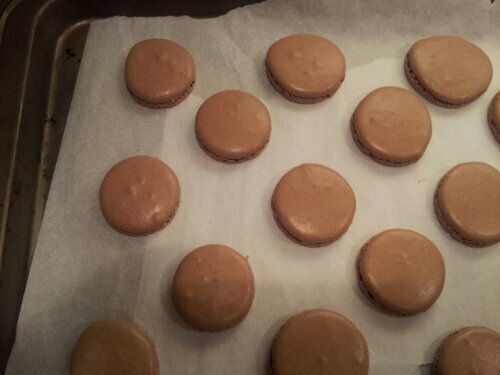 Time to make more macarons! This time Meaghan and I decided to go in a minty-chocolately direction. 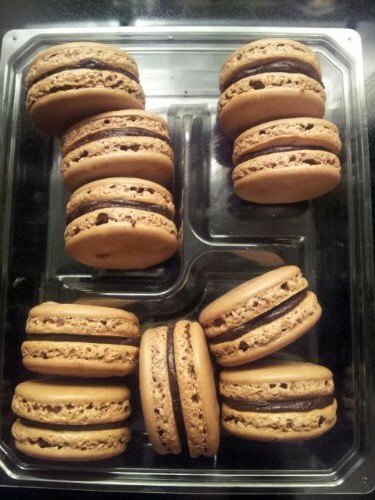 One of these chocolate mint macarons is a delightful way to finish off a meal or even eat as a snack with coffee, tea or a glass of milk. 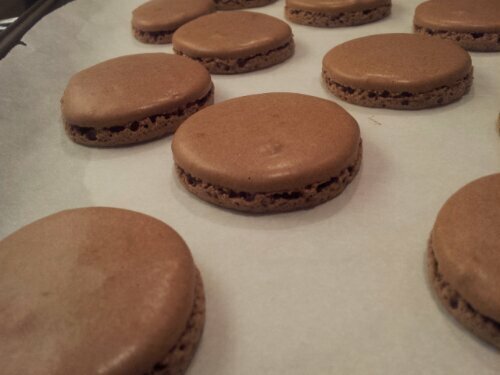 We used the exact same recipe as the Coffee Chocolate Macarons, but added cocoa powder and mint extract instead of coffee granules. It’s ok if there are still some granules left in the sieve. You can re-pulse them in the food processor. 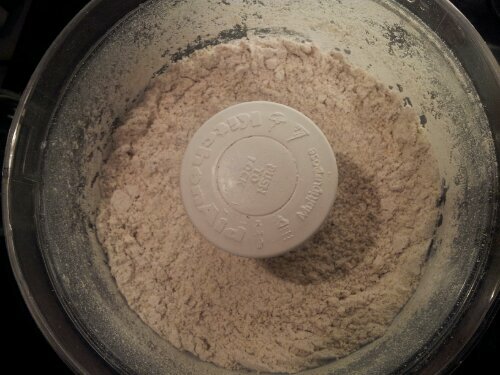 Don’t be afraid to rock your food processor so the powder doesn’t get stuck to the bottom. Medium stiff peaks is what we’re looking for. Time to “macaroner”. Scarping the batter against the side of the bowl until it’s shiny. These bad boys sat about an hour before baking. I’m interested to see if it makes a difference if they sat and got happy for 2 hours. I will make sure to try that next time! 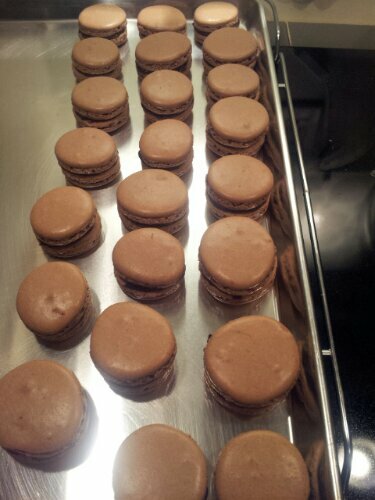 I have to practice making perfect circles for these macarons, but the slightly misshapen ones are always the ones I try and eat first! 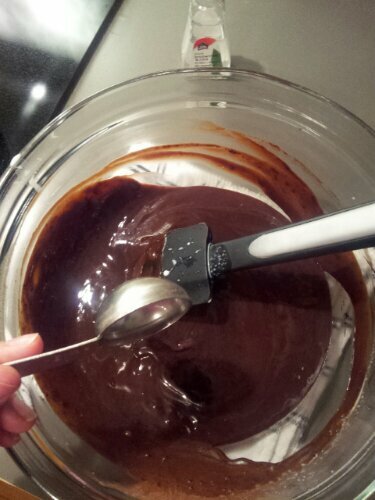 I added a full tablespoon of extract to the chocolate ganache, more as an oppsie, but it came out delicious! Very reminiscent of the Laura Secord Chocolate Mint Bars or an After Eight. 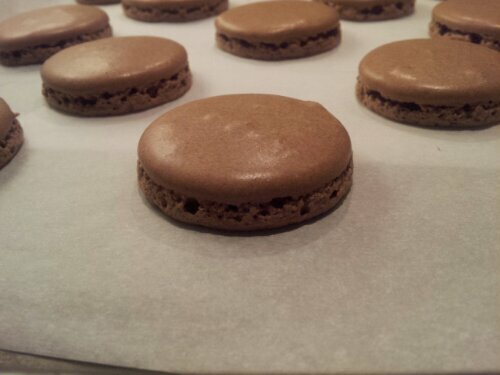 Peeling them off the parchment is my favorite part of this whole macaron making ordeal. It’s moment of truth! I always make sure to pair them up so they have partners the same size and roughly the same shape. Doing one by one might be best as the ganache stiffens a little which when you push the two cookies together, could make them concave and eventually crumble. 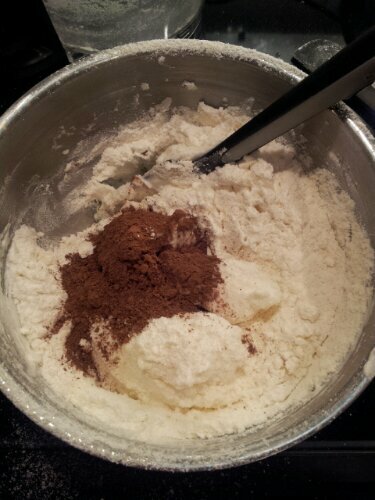 In a food processor, grind together the almond flour, icing sugar and cocoa powder until fine. 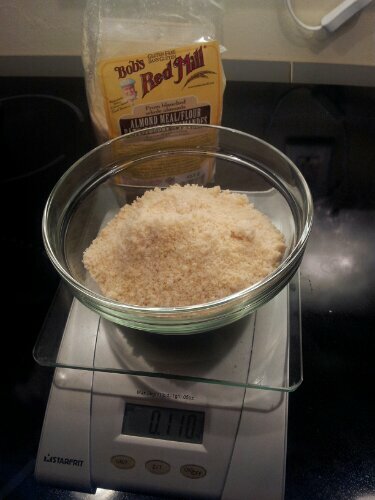 Using a metal sieve, sift almond mixture into a medium bowl. 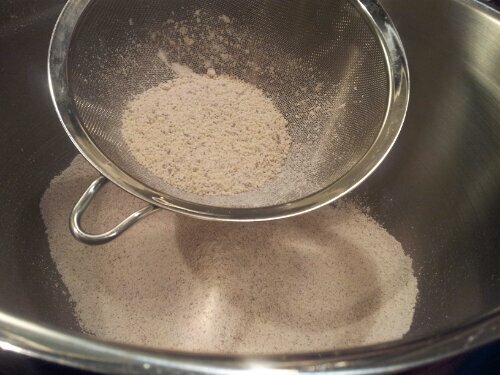 If there are still a lot of bits that will not go through the sieve, you can re-grind in the food processor. 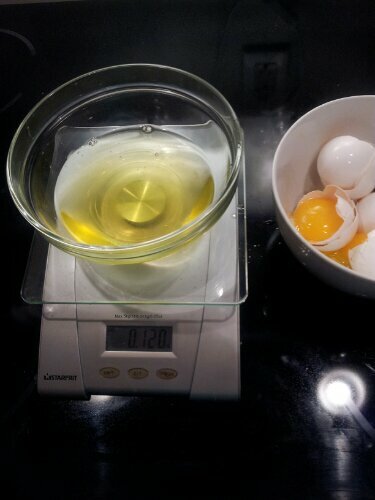 In another medium bowl, whisk egg whites by hand as not to over whip into medium peaks. 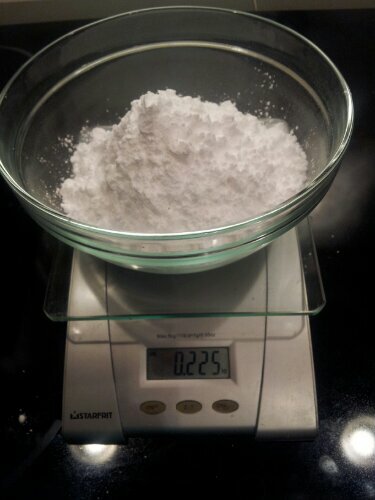 Add cream of tartar and sugar a little bit at a time. 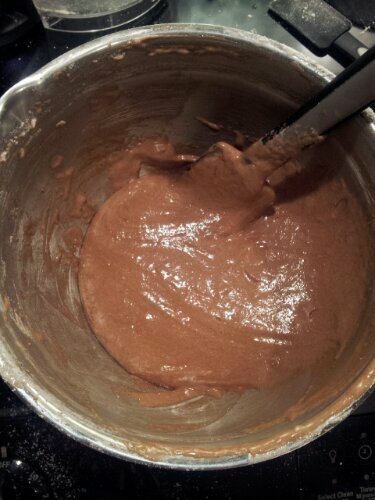 Whisking until medium to stiff peaks form on the whisk when lifted. Using a rubber spatula, gently fold in the almond mixture. 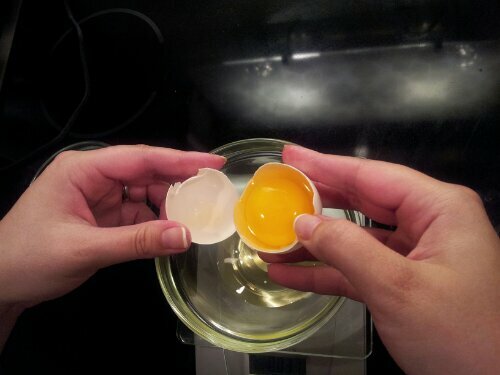 Once folded, scrape the batter against the side of the bowl until shiny. 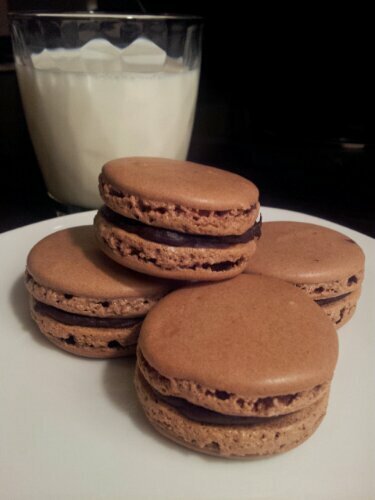 This is called “macaroner“. You will know when to stop when you lift the spatula and the ribbons of batter hold their shape when they fall onto each other for 15-20 seconds. 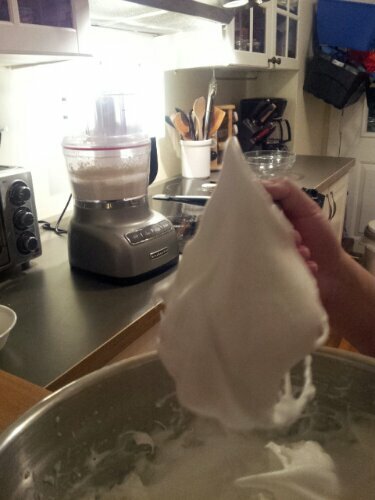 Place batter into a piping bag with a big round tip (#12). 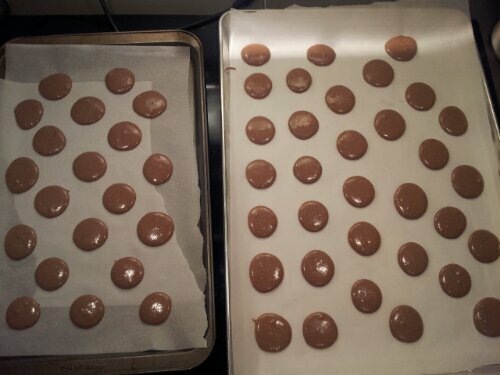 On parchment or silpat lined baking sheets, pipe out 1 inch circles and tap the baking sheet on the counter to release any air bubbles from the batter. Let rest for minimum of an hour up to 3 hours in the summer, and 30 mins to 1 hour in the winter. This is due to the humidity in the air. You can test the rounds to know when they are ready when there is a crust when you gently touch them. Heat the oven to 250 degrees F. Once heated, bake for 15-18 minutes. 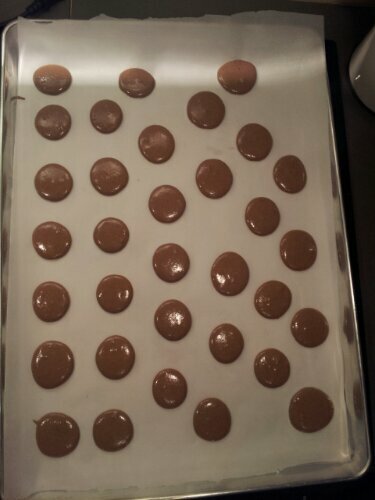 Once baked, let them rest on the baking sheet on a cooling rack until completely cool. They will peel away easily from the parchment. While cookies cool, add the chocolate chips/chunks into a medium heatproof bowl. In a small sauce pan, heat up 1 cup of cream until just boiling. Do not scald the cream. 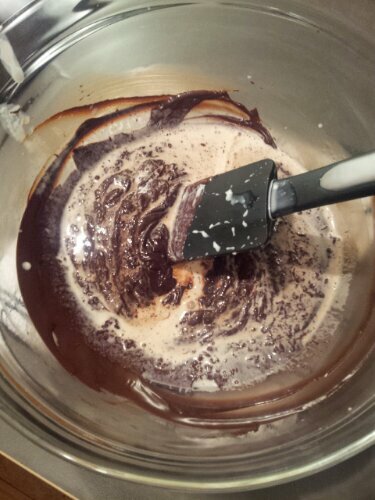 Once cream has just come to a boil, pour over the chocolate and stir until all chocolate has melted. 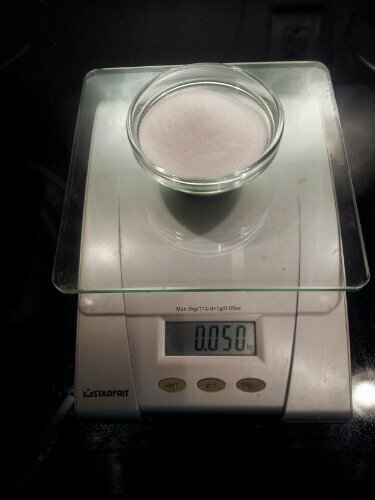 Add peppermint extract up to 1 tbsp based on preference. 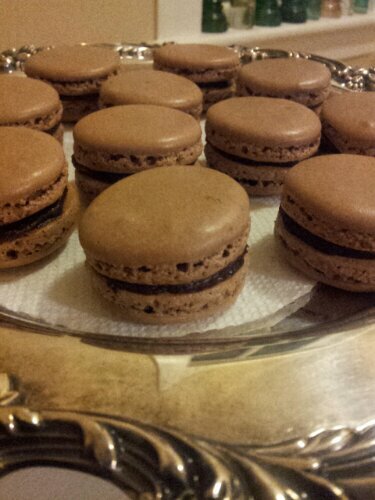 I added 1 tbsp and they came out tasting like after eights. 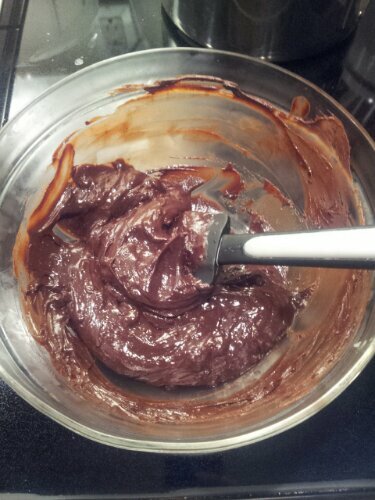 The longer you allow it to cool, the harder the ganache will be. 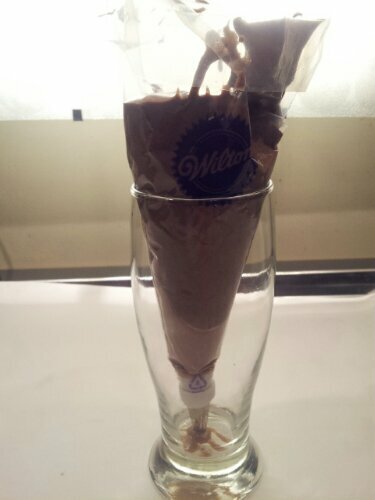 Place in the fridge to cool until pliable. 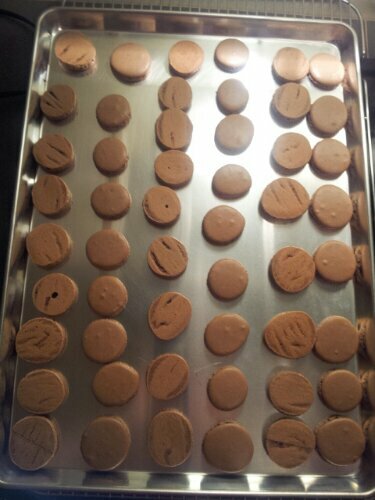 Once cookies are fully cooled, release them from the parchment and place in pairs. Take the chocolate ganache out of the fridge and with the back of a spoon, whip the ganache until it can be spooned easily and it can hold its texture. 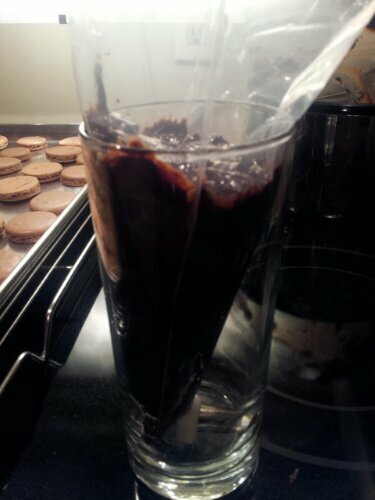 Add the chocolate ganache to a piping bag with the same #12 tip. 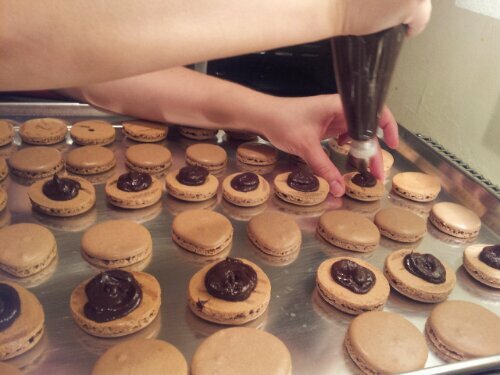 Pipe ganache on one shell and place another on top creating a macaron cookie! They can stay for up to a week in an air tight container on the counter. Glad you like them! 🙂 I tried dunking mine in milk, haha, not such a good idea.